Seattle Eye M.D.s is now Seattle Eye. Our offices are located on the 2nd floor of the Sixth and Pine Building (formerly Shafer Building) on the corner of Sixth & Pine. 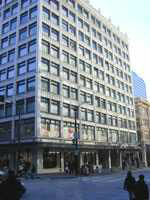 Eileen Fisher and Starbucks are located on the ground floor of the building. By Bus: Avoid driving and parking Downtown. Seattle Eye is conveniently located across the street from the 5th and Pine Metro Bus Tunnel Entrance/Exit (Nordstrom) at Westlake Station. The entire Metro Bus Tunnel is within the Downtown Ride Free Zone. Coming from the Eastside? Express buses from Mercer Island and Bellevue stop at the Westlake Station! For additional information, please visit Metro Online. By Car: Scroll down or click here for detailed driving directions. There are numerous parking garages within a one block radius, including Pacific Place across the street. By Monorail: The monorail terminal at Westlake Center is just one block away at 5th & Pine. Seattle Eye M.D.s, 'S' Eye Logo, The Future of Eyewear and Eyecare are trademarks of Seattle Eye M.D.s. All Rights Reserved. Other trademarks are those of their respective owners.